Localchella concerts come to downtown Pomona once again. I have the list in Wednesday’s column. Plus: Record Store Day news and, you may be relieved to learn, a few items that are not about music. I’ve done Localchella column items the past few years and those columns end up in my Top 10 most-viewed online for that year. Probably they’re getting a lot of Google search traffic. No fool I, I make a point of writing them the next year too. Besides, it’s nice to occasionally serve a younger audience — something I, and newspapers in general, should probably be doing more of. I heard an unfamiliar 1960s song while watching the documentary on the moon landing, paid attention during the credits to see who sang it and was floored to find that it was by the late John Stewart, who spent his teen years in Claremont. That leads off Wednesday’s column, followed by some Culture Corner items and a Valley Vignette. I’d been wanting to write about John York for at least a year, and probably longer; I first saw him perform in 2007. 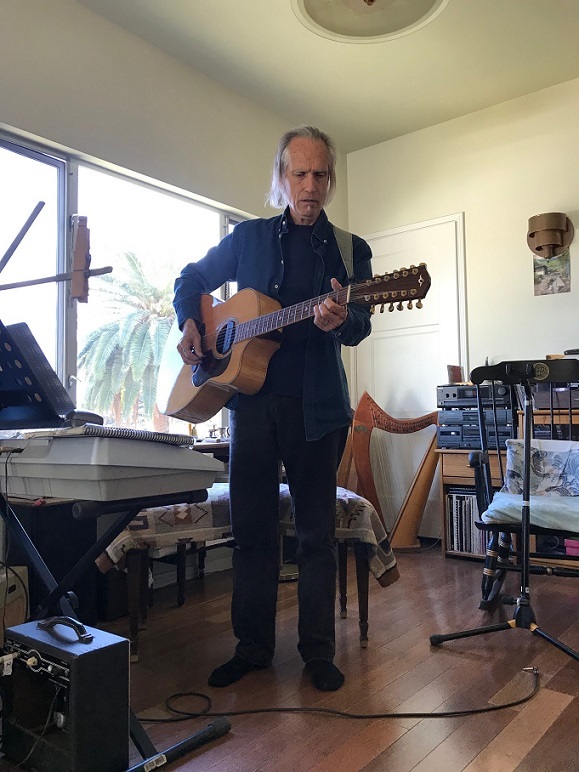 The longtime local musician was in a famous band, the Byrds, albeit after their hit-making days were past. Finally, he’s the subject of Wednesday’s column in advance of a benefit concert Saturday at the Claremont Forum. Ellen Harper runs Claremont’s famed Folk Music Center, a music shop established by her parents in 1958. At 71, she’s released her first solo record. I like it. I profile her in my Wednesday column. 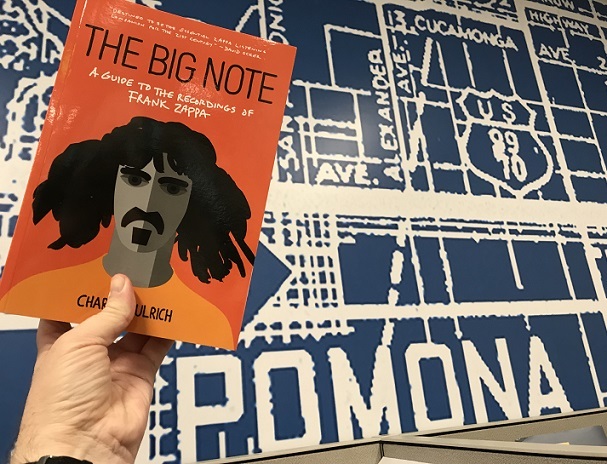 A new book, “The Big Note,” chronicles all 1,663 Frank Zappa recordings, including a few from his Inland Valley years. It’s for diehards only. That leads off Wednesday’s column, followed by reader reactions to my column last month about not being to ride a bike, a Culture Corner and a Valley Vignette. Suddenly, a brainstorm: I would use the giant, vintage map on the wall by my desk as a backdrop. Without leaving my chair, I held up the book and positioned it to get both Pomona and Cucamonga’s names in the frame. (The map stops short of Ontario.) It took three frames, as the first one had my thumb over the author’s name (see above) and the second had too much glare off the shiny cover. Secrets behind the columns! I can’t really tell you what it’s about, certainly driving, maybe street racing? The band formed in Fullerton, by the way, and is based in Long Beach. Anyway, no video from Coachella is available, but above is the band performing the song at another festival, Lollapalooza, in 2015. Wednesday’s column revisits the matter of Frank Zappa’s apparent attendance at Claremont High in the early 1950s — with the discovery of a yearbook with his signature in it. Other pieces of Zappa information are also explored. 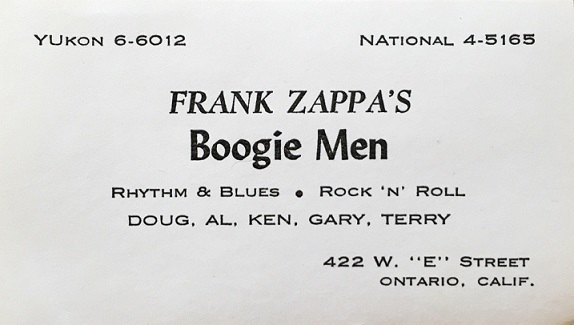 As is well documented, Frank Zappa lived in Ontario in the early 1960s, near the musicians’ store Ontario Music. 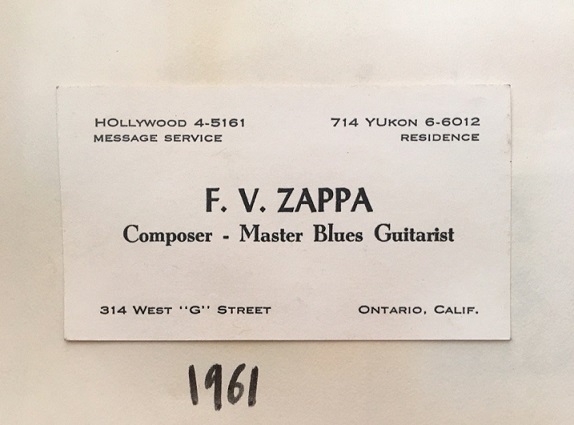 But it was still cool to see these business cards unearthed by his son Dweezil recently and posted on Twitter.